Looking back at this Part of the course, a number of themes emerge beyond the specifics of the exercises. I set up a basic process at the start (21-March). Since then it’s been modified and fine-tuned. It is working well for me. I continue to like taking notes as I work, followed by a slight polish and review after each session. Quite a bit of time is spent fiddling with photos, but even this feels like looking again, thinking again – thoughtful, attentive making. Time management also seems to be going well – this Assignment will be submitted on the deadline. By setting and keeping time-frames for each section I can fully focus on what I’m doing, then move on when time is up. There is always more I want to do, but that’s the nature of the course. This approach stops the coursework becoming overwhelming. I tried from the first to take what appear to me as risks by choosing “obvious” simple accordion pleats. They are so familiar, could I really bring fresh eyes and an open-minded approach? I’ve noticed an increasing frequency of thinking “I wonder”, then going on to try. The exercises seem designed to encourage a brain-storming approach – no idea is too wild, no on-the-spot editing. I thought I had tried to do this throughout, considering work as I did it. When reviewing work for the final Sort (23-May) it wasn’t so apparent. Perhaps this is because of the “I wonder” – “I’ll try” link. If something seemed to have potential, I wanted to try it straight away. I have included some thoughts for future exploration, some lists of questions, so certainly there is a wealth of material to return to if time and need arise. I was surprised when reviewing this Part to find as much sketchbook work as I did. There was some combined with research work early on, plus a couple of distinct posts included. 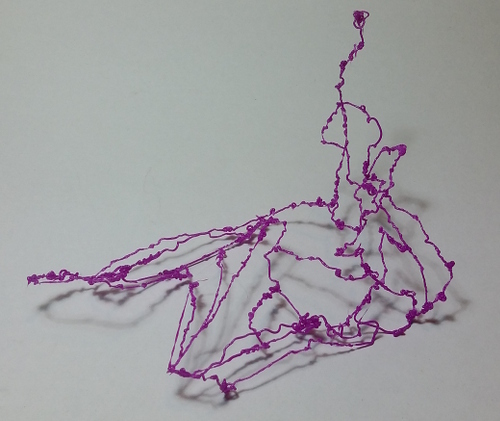 One complication has been categorisation of work with the 3D pen. Initially I treated that as sketching, although such sessions usually became just as experimental as the course exercises. Overall I think this area needs improvement. Often when working on an exercise I have a separate inner dialogue, thinking about possible future paths of development. There is the recurring question of the sort of work I want to do. Research posted 20-March lead to the conclusion I want concept, meaning and purpose beyond (not excluding) utility. Balancing this, my previous rather strident rejection of the functional is weakening. Functional and domestic associations used to be negatives in presenting textiles as art. Such boundaries and divisions now seem – not weakening, more irrelevant. Light and shadows are an ongoing interest. Back-lighting a piece is sometimes revelatory. Shadows give complexity and depth. At some stage I’m sure I’ll want to include and to some extent control lighting in a work. Space and volume attract me. 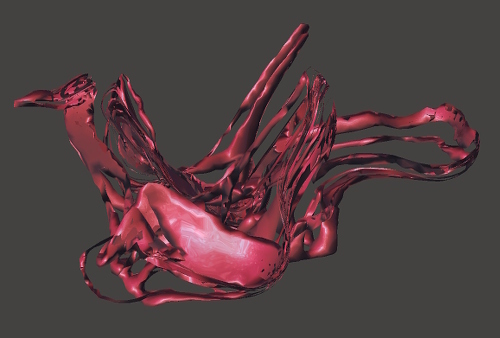 I want to learn to work effectively in three dimensions. Fragility, damage, boundaries are of interest. They can be found in many of the processes used, such as folding. Even something as simple as sample p1-1a, my first linear accordion pleat in copy paper, had a tab – unfinished business; a future connection point. I don’t want to be too neat and precise, to tidy up loose ends. A little out of scope for this course, but capturing the thought: Overlapping and combining elements can give exciting results, but I need to learn to balance complexity, to set up tensions and conversations. Resolved but open. I’m not sure what that means, if anything. How well has my work met the formal assessment criteria of the course from my perspective? I have used a wide range of materials, many new to me. I have tried to learn, respect, push their properties. My close observation of results has enabled me to identify further paths for exploration. My visual awareness has increased, and I frequently observe surface distortions in the environment around me which relate to course work. I think my tactile awareness has also improved during the exercises, becoming more sensitive to the different materials. Design and compositional skills have been less relevant in this Part, with the focus on individual samples rather than resolved works. I have been able to adapt existing skills and knowledge in the exploration of new materials. I haven’t necessarily added to my skills and techniques, except in the extension work on 3D design and printing. All of my work for this Part is being presented via this blog, in part due to cost and time considerations. This constrains my presentation, but does have the advantage of being able to link dynamically within my own work and to external resources. By its nature a blog tends to informality in presentation. My writing style is conversational, sometimes grammatically questionable, and not academic. I think this is not inappropriate in the context. Not all my ideas during this Part have been realised successfully. In this blog I have presented all samples attempted, and discussed the lessons and possibilities in all including the failures. The focus on this Part of the course has been on experimentation and innovation. I have taken risks, perhaps the greatest being to allocate a considerable amount of time to a personal extension. The results of that diversion are exciting, with enormous potential. For me the risk was worthwhile – it’s certainly a creative interpretation of requirements! I believe I am articulate and self-aware. I have enjoyed researching a number of relevant artists while doing coursework. 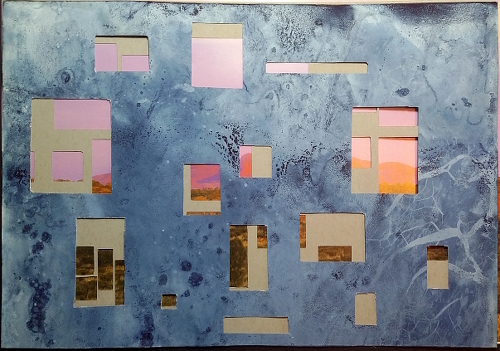 In particular, work by artists such as Megan Bostic showed me that similar manipulation of materials has a place in deeply thought and felt work. The Tamworth Triennial exhibition and related symposium was well-timed, allowing me to view contemporary textile work that deliberately challenged the boundaries of what textile can be. I set out my own goals at the beginning of the course. I think I’ve achieved all of those. I’m very happy with the work I’ve done and with the way in which I’ve done it – for all the reasons already discussed above. My assessment above seems very self-satisfied, even self-congratulatory. I’m happy with the growth I’ve achieved, but it’s always relative to where I started. It feels good to pause for a moment and look back – before I look forward to how much further I would like to go. Have I interpreted the course materials correctly and produced appropriate work? What opportunities have I missed that could be explored? Have I placed unconscious limits on myself? How can I improve, how can I push harder and further in the future? I’m looking forward to feedback from my tutor. As I am not mailing actual work to my tutor for this part of the course, this post is also a virtual selection of what I might have sent. I’ve tried to include comments about possible future development with samples as I’ve posted work, but it’s an interesting exercise to got back with a little time to forget my initial intentions and reactions. In sample p1-1f (21-March), linear accordion pleats are transformed using a few brad pins and breaking out of the pattern. It introduces a lot more volume and an irregularity which appeals to me. I also see it as a reminder that the transformations in these exercises need not be standalone, but can be part of a larger process. 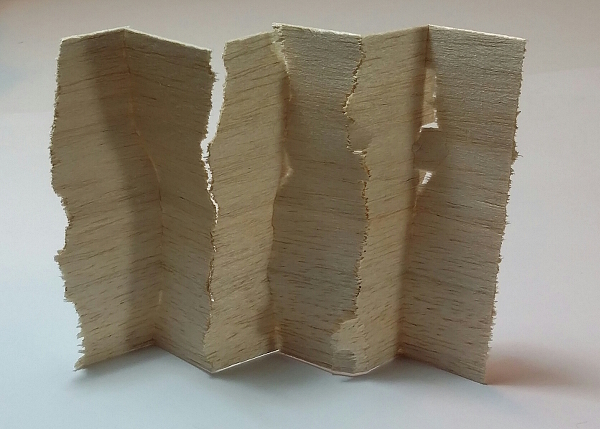 1mm thick balsa wood broke irregularly when accordion folded free-hand (sample p1-12a, 22-March). In this photograph I like the effect of cracking apart, an imperfect screen. The combination of grain of wood, shadows and highlights, together with creases and cracks creates a lot of texture and visual interest. A quick internet search has found a number of potential sources for other wood veneers, which could extend the possibilities. I wonder how a burr would interact with the folding. Using tissue paper in a pleating device (samples p1-19 and p1-20, 5-April) allowed for added textures, shaping and colour interaction. I like the tension created by the regular linear folds breaking into softer shapes. Sample p1-23b (8-April) is not a thing of beauty in itself, but it combines so many revelations / re-evaluations. There’s colour layering, strength, cutting (sealed or distorted edges), hand stitching (machine stitching in another sample), recycling, sharp folds, gathering, the contrast of natural and synthetic… So many paths to explore. Sample p1-26 (10-April) brings the extra element of volume. The distorted grid looks great and the red/white palette is dynamic. 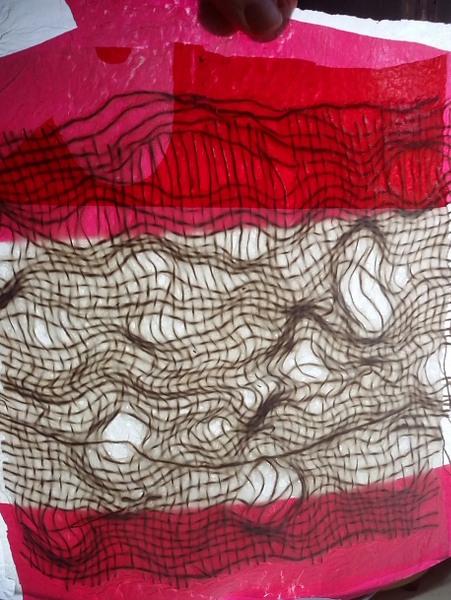 I would like to explore layering with tension applied to one or more layers while bonding. It’s a classic idea in weaving – for example seersucker using warps under different tension. That leads to thinking of an alternative method, combining materials that respond differently to a process. I should have tried more of that when shrinking by applying heat. 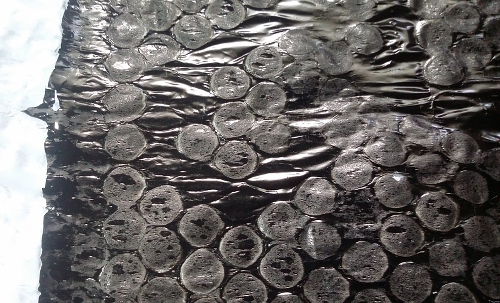 Fusing carrier bag to bubblewrap with selected bubbles pre-popped (sample p1-28, 10-April) resulted in contrasting textures which I thought could be used to capture text. I like things that aren’t too obvious, a bit of a puzzle where the viewer has to work a little. I was disappointed with sample p1-31 at the time (10-April). When lit flat from the front the distorted weave wasn’t visible. Using different coloured layers of plastic in front and behind could assist that. 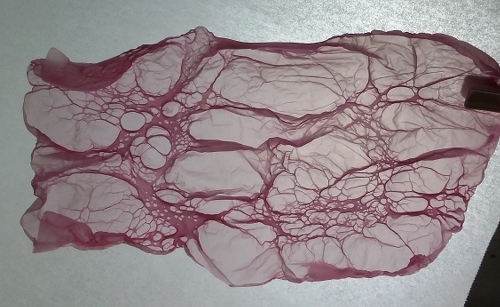 Now I think the stability given by the plastic layers to the distorted fabric could be really useful. I’d like to go back and try cutting into it, see how the edges behave. So much movement and apparent shape in something that was actually pretty flat could also be useful in the right context. Including materials that bend and then hold shape (sample p1-40, 11-April) provides another way of adding volume to the layered plastic. In the sample I used sections of drinking straws, but other possibilities could be pipecleaners or wire. In the same work session I used disperse dyes on the carrier bags, which took the colour very well. This opens up a lot of possibilities in colour of course, but also patterning and perhaps text (using mirror writing, or perhaps showing through backlit layers). In sample p1-52 (19-April) I was trying to create holes by weighting areas of plastic with kinetic sand while heating with a blow torch. The holes didn’t appear, but I like the massing of different sizes of bubbles that resulted. This could be the start of a pebbly beach, or simply an area of textural interest. 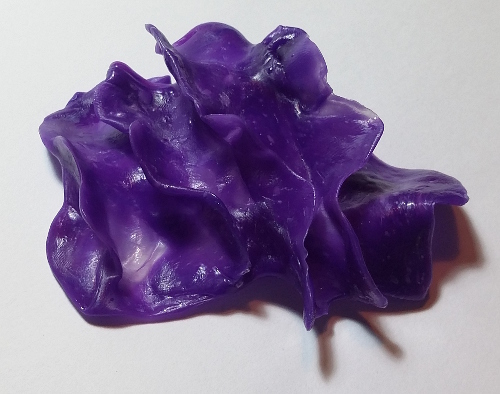 Sample p1-62 (20-April) has a wonderful cell structure in a very light and flexible plastic. Intriguing in itself, but also a good example of the impact of different techniques. This plastic was not exciting when fused between ironed layers, but reacted very well to the heat gun. 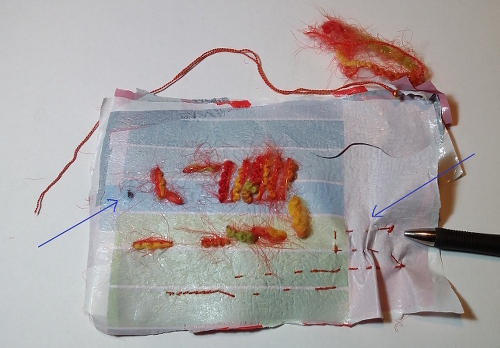 It is not brittle, and the texture shows up well even when front lit, so I think this could be integrated quite easily in a stitched work. The colour could restrict its use, but other samples using a slightly heavier plastic tablecloth gave similar results in plastic that is easily and cheaply available in a range of colours. 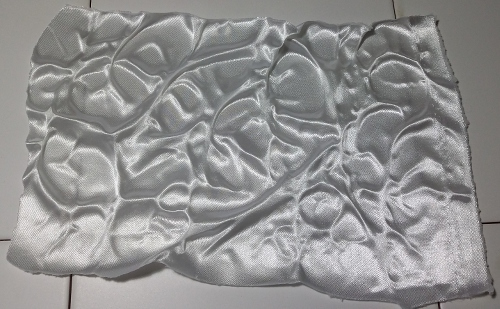 The polyester satin of sample p1-71 (21-April) is just one of a number of synthetic fabrics which I think became more useful and appealing after being distorted using a heat gun. Breaking up the flat, reflective surface creates a lot more interest. It could be a useful way of bringing light into an area of a fabric piece. 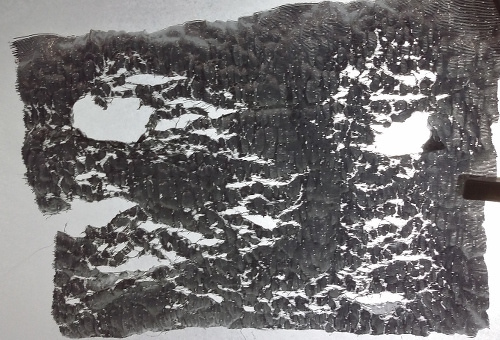 While visually interesting the damage caused to a silver lame by a heat gun would make it very difficult to use directly (sample p1-74, 21-April). 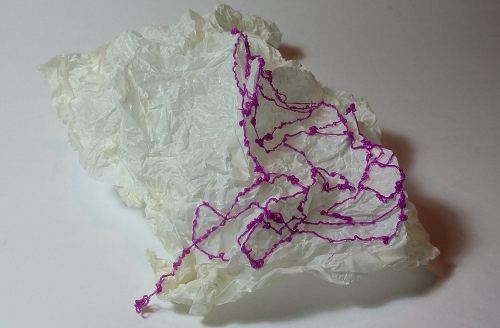 It might work supported by fusing to organza, or perhaps even fused between layers of plastic. I worked with a number of other metallic looking materials on the same day, each of which could be useful in different applications. 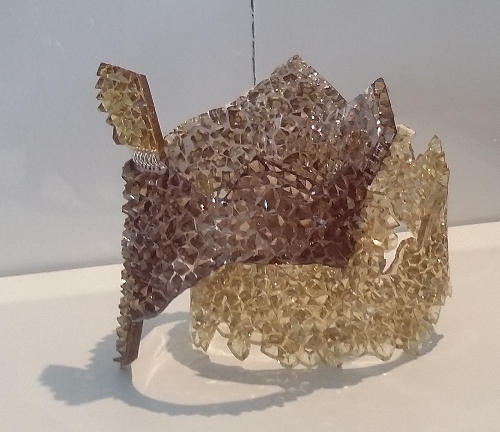 Synthetic crystal organza responded strongly to the heat gun and produced lots of possibilities. 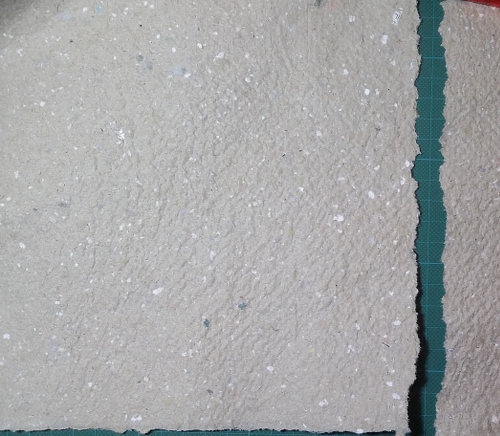 I’m illustrating this with sample p1-77 (21-April), where I used kinetic sand to shield areas from the heat. Varying the amount and distribution of the sand opens up a lot of possibilities for controlling the impact of heating, at least to an extent. In this sample I was hoping for more general distressing rather than complete disintegration of the exposed areas. Using smaller and lighter areas of sand would be worth exploring. I found the edges created in tearing of interest, but once again responded more positively where extra volume or dimensionality was created, as in sample p1-82 (26-April). Here the grip of my hands distorted the surface, which captures a sense of the force required to tear in this way. Layering up a series of tears also added a little volume and some additional shadows. It’s a good reminder that the different samples don’t need to be seen as discrete entities. Something that is relatively bland on its own could look quite different when used as repeat. 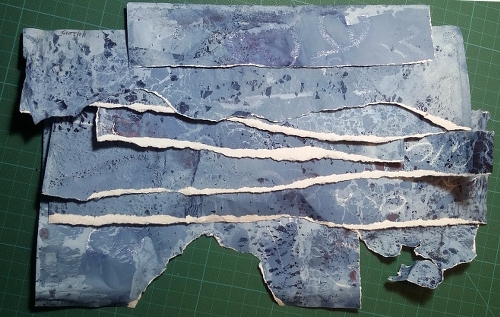 With all the tearing examples, like the handmade paper in sample p1-89 (26-April), it was interesting to look not only at the shape and layers revealed at the edge, but also the negative space created between torn edges. In this example the inclusions in the wet pulp led to inconsistent tearing which was particularly effective when working slowly. The space between … I’m always interested in boundaries, and it also brings to mind ideas of movement – towards or apart. The extra thickness of the torn edge of cork in sample p1-107 (26-April) brings attention right back to the edge of the tear. I would like to take this further, perhaps layering up multiple torn pieces for even greater depth. Are there other thicker materials that would tear cleanly and have that sense of density at the edges? (for example if one could tear thick felt it would leave fibres at the edge, not so clean, and corrugated cardboard would only be thick in parts … which could bring its own interest). Cutting holes and layering pages gives a lot of possibilities for combining materials. In sample p1-117 (7-May) I wanted to try to reveal enough of the background image for the landscape to be readable, without being immediately apparent. This was one of many attempted combinations. I’d like to try again, this time working from the background forwards to make sure key areas are revealed or concealed as I choose. However it was layering and revealing in a single material, corrugated cardboard, that really got me excited. Sample p1-129 (7-May) is the one with most depth. It really makes use of the strong linear elements of the cardboard, together with its depth. On the other hand, introducing some quiet areas as in sample p1-128 (7-May) also worked well. This is much less dynamic, with all the corrugations aligned, but there is still some depth and variation. Every time I used this material in different exercises I found it of interest. In my initial experiments in the scratching exercise I made the mistake of persisting with a plan despite poor results. P1-136 (indigo dyed paper, 17-May) shows a rather nice series of lines here and it could be effective to try more. 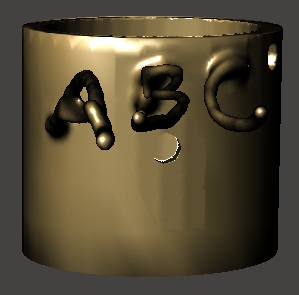 Perhaps a form of cross-hatching could be developed to create a drawing / shading type result. However the other sample materials didn’t work as well. I’m including this as a reminder of the balance needed – sometimes it’s good to push through to find more. Sometimes there’s not enough promise to make it worth the time. On the other hand, almost everything I do with corrugated cardboard seems to have promise – as a material in itself, or in starting ideas that could be developed in other materials. For example sample p1-140e (21-May). 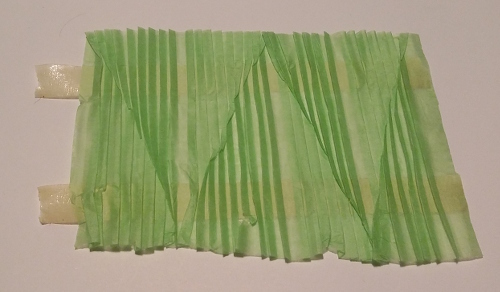 In the accordion folding exercise I concluded that I’m not a fan of too much regularity. Here it becomes a strength, a base rhythm supporting the marks and providing so much movement as the lighting changes. 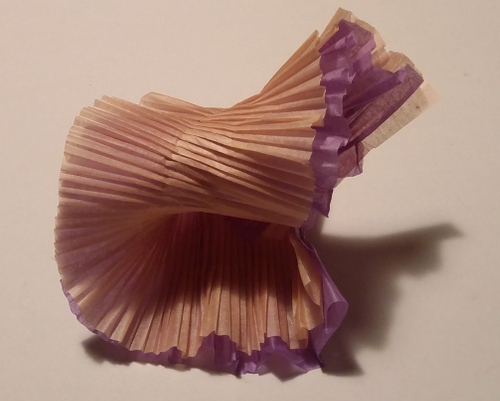 Now I want to play with more tissue paper in the pleating device, create a softer, personalised “corrugated paper”, and see if I can get similar – or different – effects. Perhaps add in some colour layers. Perhaps in fabrics with stitching rather than scratching. I developed a number of ways of scratching into photographs, moving slowly because it feels such an angry, destructive action (sample p1-141). However once I worked past that emotion I was able to focus on the power of the scratching to draw the eye in a busy image, as seen in sample p1-142 (21-May). There’s so much energy in those marks, and by removing most of the detail it leaves me wanting to hear a story. It’s so melodramatic. Would it have the same impact if I added, embellished, rather than removed the surface? The same amount of the photograph may be hidden, but the emotion suggested could be quite different. One substantial area of experiment which I haven’t discussed above is my personal extension project of 3D design and printing. I’ll write about that separately, as I want to present it as a substantial and relevant project, consistent with this assignment and producing multiple samples with potential. I found myself looking at the exhibition and the individual works through a number of lenses – themes and questions developed by the curator; the individual artworks and artists; extra information and threads from the half day symposium; recent exercises in my OCA course; and my personal responses and the impact of all of these. Cecilia Heffer, the curator, presented a number of themes within the exhibition, the catalogue and the symposium. Textile thinking or the textile approach. Is this different to other disciplines? What can be found in an inter-disciplinary approach? Textile expertise – dedication to particular techniques or the increasingly common mixed approach. Poetry – flights of imagination, or more literally with a number of exhibits which related to texts. Heffer deliberately questioned? challenged? the notion of “textiles”. 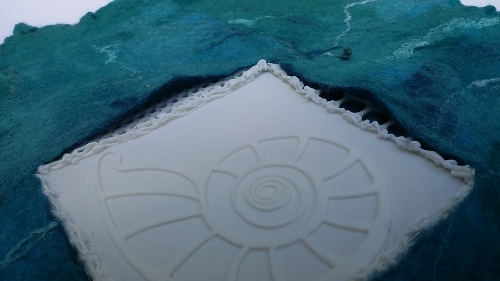 Is Kath Inglis’ coloured hand cut and carved Polyvinyl Chloride a textile? There are some looped (stitched) connections formed with sterling silver. Does that change your response? I think it is a little provocative, a discussion starter. It extends the meaning of “textile” beyond common use, and of course that’s how language develops and changes. Is it a useful change, providing us with new insights? If you believe boundaries between disciplines are blurring then less distinct, less descriptive/prescriptive meanings could be useful. If there is blurring will “textiles” be a useful term at all, or will it be subsumed into something else? Such as “mixed media”. I’ve chosen a few works which seem particularly relevant to my current development, interests and studies. Lorna Murray invited us into the studio and identity of a textile artist. Ephemeral, throwaway materials were transformed in a quirky and delightful way. Wood was carved into traditional textile tools. Colourful cocktail umbrellas were deconstructed and became spools of thread, or stitched into a faceted fabric that stretched across the work bench and into a roll. Fresh from my folding experiments I itched to create new structures with those triangular segments. Murray’s work celebrated the traditional in a very modern way. Jemima Parker’s work undefined objects at first glance may seem very close to some of the surface distortion I have been exploring with OCA. There is pleating and with individual items strong dimensionality. Her statement references the art / fashion boundaries, garment and body adornment, functionality. However I didn’t find it intriguing. Perhaps it was the rather static placement on the walls, bland lighting and limited colours evenly distributed. Somehow surface distortion became flat. The glimpse of Anitia Larkin’s The breath between us around the corner, tempted me to pass on swiftly. 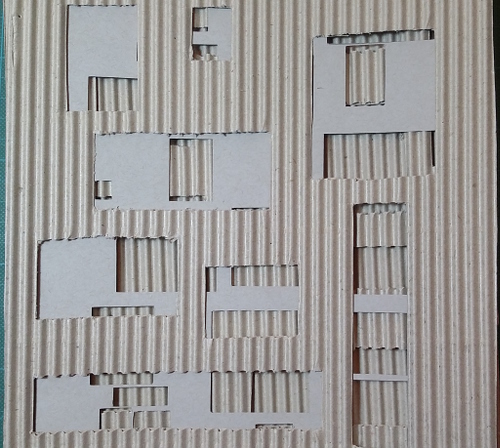 I’ve mentioned Mandy Gunn’s work in a previous post (7-May-2015) when I was cutting and layering corrugated cardboard. Gunn’s work uses recycled shopping bags on cardboard construction. 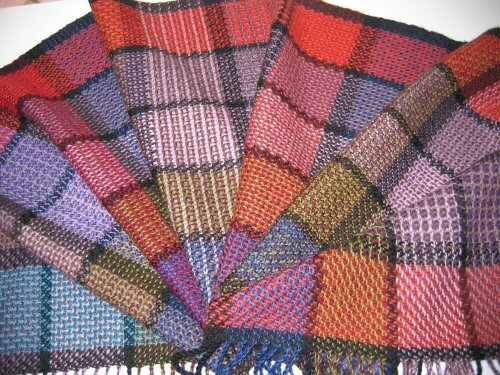 This work references weaving, reminding me of a colour and weave sampler from the past (8-November-2008). This linking of textiles, textile sensibilities, with mixed media illustrates the power of discounting traditional disciplinary boundaries. There’s also a modern nod to concerns about recycling, consumerism (all those shopping bags) and collaboration (in the sourcing of materials). Above to the left is a detail of the front stitching of Pranayama, a work by Gillian Lavery. On the right a sneaked view of the back. This was a pool of stillness in the exhibition. A length of light silk, slightly swaying in the breeze of air-conditioning and passing viewers. 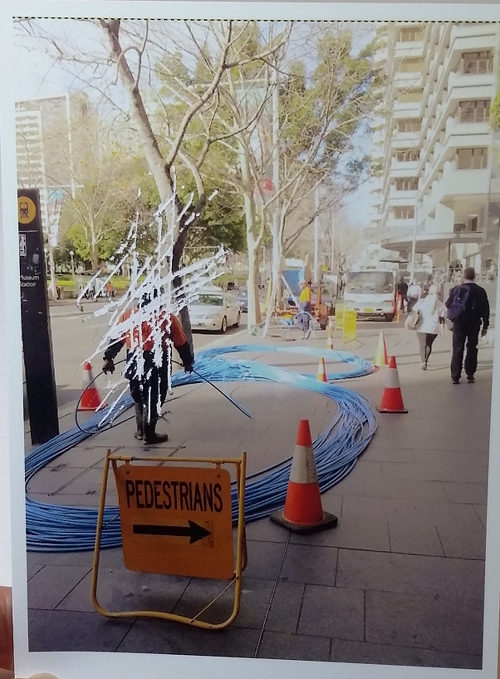 Nearby was a small screen showing a looped stop-motion video of the work as it was being made. Each day for a year Lavery measured a length of black cotton thread, reaching from mouth to belly button and back. She stitched in a spiral, focusing on her breathing, her thoughts sometimes wandering, until an alarm sounded at ten minutes. The remaining thread was pulled through the back and left. Cotton weights stitch length varied as the breath of ten minutes each day was experienced and observed, as the stitches spiraled outwards. I wanted to see the back, those hanging threads of time expired. I gently blew to move the fabric away from the wall so I could see and take my photograph. I think this is one of the most pure textile works I have ever seen. An idea. A length of fabric. Threads. A needle and embroidery hoop. A needlewoman. Time. Breath. It’s a seductive work. A dangerous one. It makes me wonder about what we’re all doing. Racing around, crossing boundaries, seeking new materials and processes and combinations, telling ourselves “cross disciplinary designers” can discover what dedicated in depth study can miss. We favour the unfamiliar, the exotic, “originality”. We see fads, fashions, and the perversely different for the sake of being different. We want to do everything – and do it in a way its never been done before. That last paragraph is quite misleading and unfair. 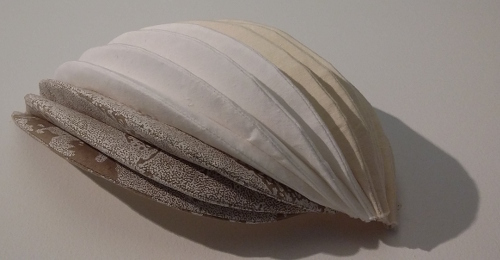 Her website bio states “Gillian Lavery’s art practice is a process-based drawing practice informed by her background in textile art.” (http://www.gillianlavery.com/bio/). Crumbling barriers open new paths. I just want to be sure to take a breath every now and then. Following the lessons of the first session (17-May-2015), this time I started by looking for materials which I thought might respond well to a variety scratching. Thick, layered, potential for colour or texture changes could work. Photos – hide or delete. Add or extend. Corrugated cardboard thick and thin. 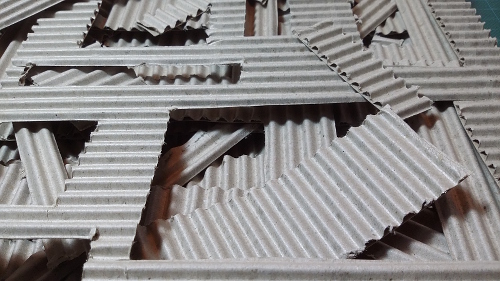 Corrugated cardboard – largeish ridges, suitable as a protective wrapping when packing something. A series of marks with a flat blade screwdriver. I find the ones that bend the ridges rather than breaking through are more interesting. The folds create shadows and highlights that cut across the regular lines of the ridges. It looks different depending on angle, which makes me think of hidden messages. (I remember doing some kind of shadow knitting in the past, where the motif was only visible from certain directions). Using the same tool on the other side gives strong lines when the corner of the blade is used. Heavier pressure creases a more indented line which flutters as connection points to the ridges below are crossed. Using the flat of the blade either breaks through the layer, or leaves a broad line which catches the light more subtly. The shadows are finer, broken lines, the highlights more diffused. A 12mm square notch adhesive spreader. This had only a small effect, although lighting direction is again significant. Perhaps the plastic notches were too flexible to scratch effectively. 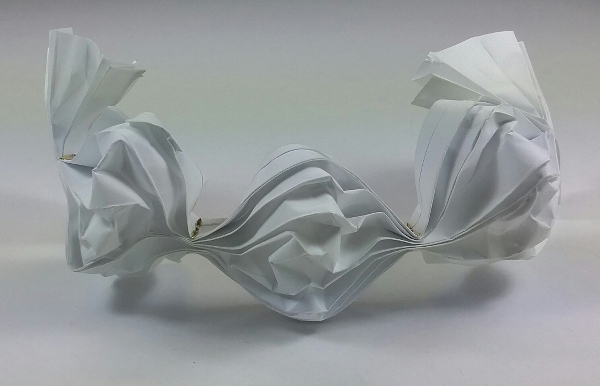 I wanted to create wider folds without breaking the paper. The rounded end of a toothbrush worked. Lighting again critical. 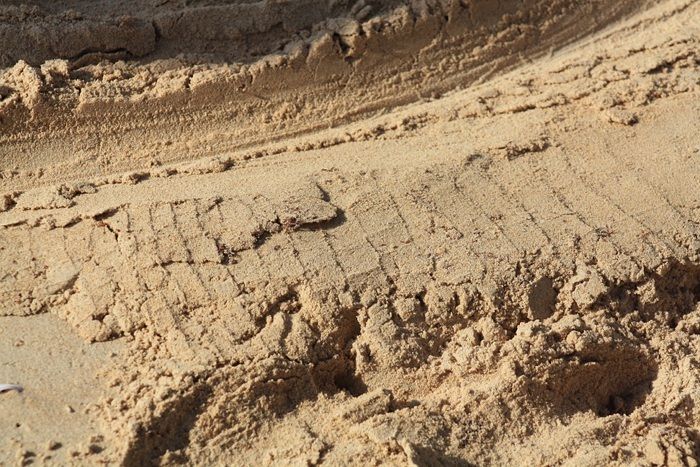 From one direction it reminded me of crocodile tracks seen on an NT beach a couple of years ago (see post 29-August-2013). Worrying less about breaking the surface (this is “scratching” after all) I used a fork in undulating lines. Lots of movement and changes according to light. I wonder if it would be possible to get this effect on a textile then drape it to catch the light in different, changing ways. I used the corner of a boot knife to create a series of radiating lines. Generally the paper ridges folded quite crisply, rather than breaking or cutting as I part expected. I moved the knife quickly and felt I had a lot more control of direction. In one photo the cardboard is curved, trying to capture those variations in light. Now wanting to break the surface I used a hacksaw blade. When moved straight across the ridges it created a fairly neat cut line. When used at around 45 degrees to the ridges the surface was abraded rather than cut. More reckless and forceful than before, a series of marks using a metal skewer. The surface broke and folded. I like the varied, rough texture created. The metal skewer again using similar force and gestures, on the other side of the cardboard. I get a feeling of depth in the marks, but not the strong, varied shadowing that I find so attractive in earlier versions. Undulating lines with a fork on the flat side of the cardboard. The photos show the cardboard curved to get a range of lighting angles. Another great set of lines. I really like this material. The shadows are exciting and varied. Lots of potential. When I first thought of scatching through the layers of a photograph, scratches through a face was obvious. I found it such a violent idea, so aggressive and full of anger that I baulked at doing it. Finally I found a photo I took in the Nicholson Museum. (report post from that visit 31-May-2013). 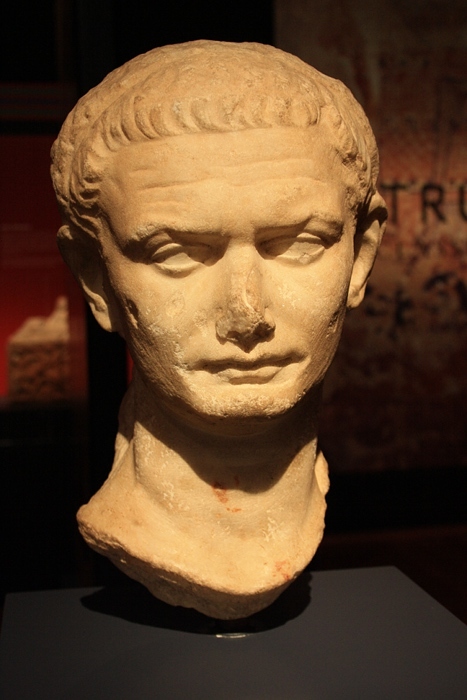 This marble head from a statue is Titus, Roman, first century AD. My scruples could cope with scratching this. The metal skewer removed more material from the mouth, but doesn’t give the sense of violence that I am now expecting. The flat blade screwdriver in criss-cross marks took up material around the ear very well (perhaps a despot that didn’t listen to the people? Some fragment threads of the surface remain attached. I wonder if some use could be made of that. Influenced by ideas of classic movie scenes I scratched across the neck with the tip of a pair of scissors held in my fist. A good variety of mark – I think I can see anger there. What if I really wanted to obliterate part of the image? I attempted using the flat blade of the screwdriver held to dig away as much surface as possible. I’m surprised how much of the head is left. I used a broad rounded pallette knife. Pushing away it just skidded over the surface, but pulling forward it created these wonderful broken lines. No sense of anger, but great patterning. Back to the classics – a house key. Actually the most effective in angry marks and surface destroyed. Using the experience of the previous sample I used another photo – when taken I was interested in the large-scale thread management (they seem to have created a cross, as if winding a warp). This time I actually scratched out a person (only seen from the back). In a busy street scene I was curious whether the scratching would actually make the person more conspicuous than in the original. I think it’s very effective at drawing attention. The idea that the absence or void left by something speaks so much of them is something to continue exploring. My final photo, taken at Wave Rock in WA (post 17-October-2011), was more difficult to alter than I expected. I used a series of small screwdrivers plus the metal skewer trying to create my surfer. At this point I ran out of time for the exercises. I need to do some final sorting and review, and the deadline for this Part is looming. I really regret taking such a methodical approach in the first session, wasting time “completing” samples that weren’t taking me anywhere. At times I have got good results pushing beyond what I thought would work, but I need to find a balance. I was attracted to this exercise as another way of distressing the surface (like folding etc). Does it have to be a solid surface? Scratching in plasticine or wet paint. Scratching on a surface and then printing from it. Choosing fragile materials or materials with a fragile face to scratch. I started by collecting an initial pool of things to scratch with. I decided to start on some indigo dyed paper, as the surface marks easily and scratches should be visible. After the first attempt (Sample p1-136, A1) I decided to work on multiple pages at the same time. Looking back I’m not sure why – efficiency in producing samples probably. See my comments at the end on this choice and the consequences. I worked on four A4 pages at the same time. Top row, left to right: T pin, flat blade screwdriver, fork, boot knife, serrated knife, hair comb, wooden skewer, hex screwdriver, screw bottle top. Bottom row, left to right: Fine toothed wool carder, paint brush, large compass. A1: T pin, held at angle to paper, dragged up to the right. P1-136 An irregular mark, with bits of the surface lifted. P1-138 Fine irregular lines, change in visibility at different angles. P1-139 more lifting of paper, giving better shadow lines. B1: T pin, held perpendicular to paper, dragged down without great pressure. P1-136 line appears more dotted / beaded. P1-137 learnt to be very gentle to avoid ripping. Tufty look in lifting fibres. P1-138 initial scratches hardly visible, so used more force. A more fine, precise look. P1-139 little to see. If increased pressure to create more of a mark, wanted to catch and tear. C1: T pin drawn in a spiral. P1-136 hard to manage. Jumps in line. P1-137 Similar difficulty with jumping. P1-138 was able to get closer to a continuous line, but hardly visible. P1-139 I like the variety in the line, with different levels of catching. P1-136 generally bolder, more consistent lines, although a few didn’t catch into the surface. P1-137 couldn’t find a pressure balance to make mark but avoid tearing. P1-138 fine lines, few catches. P1-139 hard to see (except for slight rust from the screwdriver!) A slight dent, no catching. A2: Flat blade screwdriver, held in fist perpendicular to paper, short curved scratches. P1-136 Marks more gentle, look a bit like fishscales. P1-137 Some broader fluff marks on some of the upswings, but subdued. P1-138 Marks a bit more visible, as scrapes across the surface. P1-139 Also more subtle, more broad scrapes across rather than scratching into the surface. B2: Fork (from picnic set – steel, but light). Held with 4 tines touching paper, drawn up to the right. P1-136 Hard to get marks initially. Held fork more perpendicular and used more pressure. P1-137 Tines make wider lines and more consistent lines than earlier. Makes me think of furrowed fields. P1-138 Used quite a bit of force to get marks. A bend to the marks that look like grasses in the breeze. P1-139 Marks inconsistent. Areas of general abrasion. C2: Fork as above. Held with 4 tines on paper, guiding finger pressing them down, pulled down page in undulating lines. P1-136 Inconsistency in lines. Generally fine to very fine. P1-137 Got one tear and had to lift up. With care and luck this could create a nice texture. 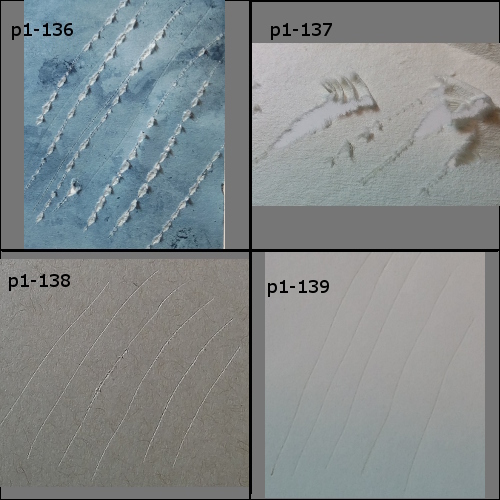 P1-138 Clear lines, indenting but not abrading the surface. P1-139 Similar to above. Hard to see. D2: Boot knife, dragged smoothly down to right, front corner pressed down. P1-136 too much pressure – straight cuts through paper. P1-137 tried to adjust pressure, with mixed results. Tears rather than cuts. P1-139 very nearly cut through. A3: Boot knife, quick short movements down to the right. P1-136 managed not to cut through. Visibility varies depending on angle of light and view, but a little like stylized drawing of rain. P1-137 Hard to see. Noticed while turning it to view that the lines encourage folding in the paper – could be useful if doing shaping. P1-138 At detail view there is some variation in shape and depth where the knife corner first hits the paper. P1-139 Not much to see. Almost cut through paper. B3: Serrated knife (from picnic set – light steel), dragged down to right trying to keep length of serration on paper. P1-136 Straight, sharp lines, a little wider and abraded at top. P1-137 Mostly managed not to catch. Lines fairly continuous, with lifting at both sides almost in occasional Vs.
P1-139 Fine lines. Almost cut through. C3: Serrated knife as above. Serration held flat to paper and dragged to right (each serration making a separate mark). P1-136 Mix of parallel lines. Almost looks like a paintbrush effect. P1-137 Once I learnt to be gentle got large area of abrasion with some finer horizontal indenting visible. P1-138 Went over and over trying to get something to see. Lots of fine lines, some abrasion. P1-139 Similar to p1-138. Very understated. A4: Plastic hair comb, drawn up to the right. P1-136 A few faint lines. P1-137 Indentations without abrasion – first tool to produce this on this paper. B4: Wooden skewer drawn down in undulating line, then when not much seen on indigo, dragged up to the right. P1-136 Almost invisible. Went back and tried again after relative success on other surfaces. 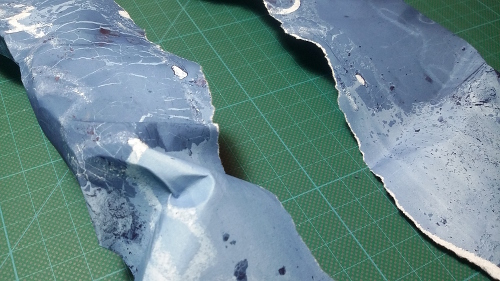 Still not good – this paper looks best where the surface is broken and contrasting colours seen. Simple pressure lines get lost in the overall patterning of colour. P1-137 Both movements worked well, clear marks without abrading surface. P1-138 Can see a bit if the light hits at the right angle. C4: A hex screwdriver, held down and twisted. P1-136 At an angle see slight scraping of surface. P1-137 There is some shine in circles where pressure from screwdriver “polished” surface, but most obvious marks are colour rubbed off. P1-138 Again get a circular polished effect, seen more in raking light. P1-139 Some polishing and some partial indentation. Very understated. D4: A screw bottle cap, some small “tags” where the seal was broken. Held down and twisted. P1-136 Some catching and tearing of surface. Circular pattern is not apparent. P1-137 Good circle indentations with some abrasion. One small tear. P1-138 Circles visible, but not smooth. A5: Fine toothed wool carder. Drawn down. P1-136 Didn’t break surface, fine lines visible as polishing in some lights, and rough to the touch. P1-137 Inconsistent areas of abrasion. No lines visible. P1-138 Rough to touch. Some polished lines in raking light. B5: Wrong end of a cheap plastic-handled brush. Drawn up to the right. P1-136 Some faint broad scrapes. P1-138 In raking light can just about see dotted lines of inconsistent polishing. P1-139 Very little to see. D5: Tool for drawing large circles, using pencil as pivot point and normal pivot to scrape paper. P1-136 Tricky to control tool. Inconsistent lines. Overall the softer papers showed more variety and visibility of marks. The smooth papers gave little if any interest. The indigo is best where the surface is lifted and there is contrast of colour. 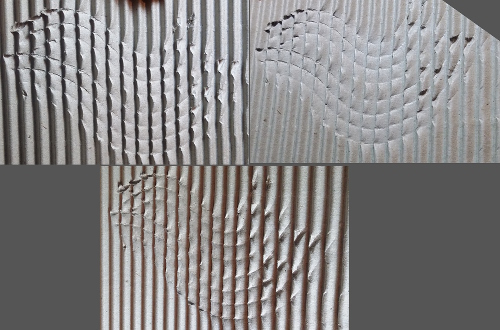 The handmade paper gives more of a textured result, with impact variable depending on angle of lighting. All the photographs above are different scales with lighting at different angles, trying to show each result as well as I could. They actually flatter the overall pages. Experiment references are included in the photograph above. The other samples all follow the same general placement. Overall I’m disappointed with the results, which I think come from a flawed process. I started with tools, not materials. Then I turned it into a kind of production line, one tool at a time and four different materials. I didn’t respond to a result and follow it up with a new idea. By not focusing on a single material I don’t feel I explored or took advantage of its particular properties. The indigo and handmade papers gave the greatest interest. Thicker and/or layered surfaces seem to offer more when scratching, allowing a contrast of colour or texture without actually causing a cut or hole. I don’t feel inspired to take any of the particular samples above further. I started this sequence of work 23rd April (dated by photos and Evernote), three weeks ago. Are my notes good enough to pick up the thread? It began with reviewing work to date. I decided to work with some of the samples in my sketchbook. First “rubbings” of a range of them, using rice paper and conte crayons. 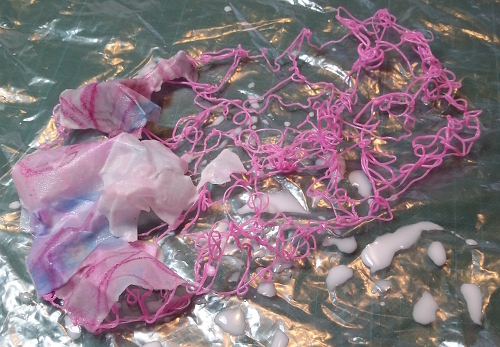 It started with the pink in the middle (from felt sample p1-68), which I thought was uninteresting, then got worse. Decided to treat it as background texture, and rubbed over with a paper towel to blend it in. Drew over with inktense pencils, based on sample p1-75. Then tried to move colour around with water. It didn’t look promising, so went to one side to dry. 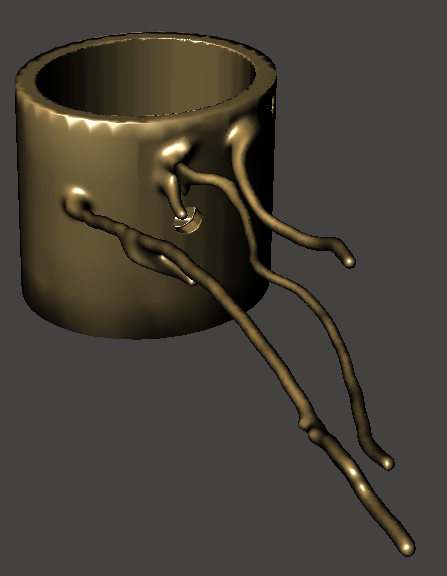 Next idea was to draw one of the samples in 3D. I really wanted to get the sense of all the movement and cells in the original sample (p1-62), but take advantage of the pen by adding some extra dimensionality. I traced over the general shape first (baking paper between), then embellished. I can see the relationship, but quite different too. 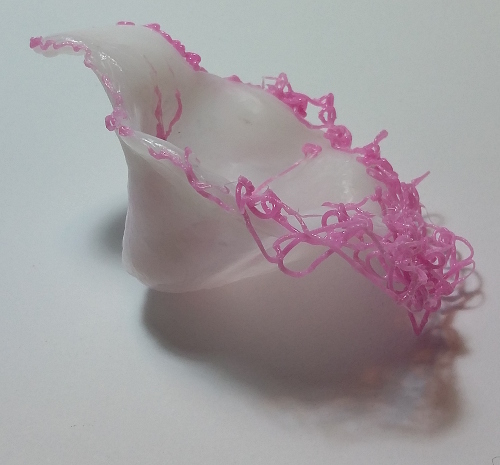 Then I tried using the 3D pen on a piece of polymorph (part of sample p1-5, that reformed during a demo to a work colleague). I tried to play up to the accidental orchid reminiscent shape. The filament feels quite well attached, and it was quite straightforward to add a sketchy line tracing along one part of the edge, and a more lacey effect on the lip. What would happen if I remelt the polymorph? The polymorph softened, but the pink from the 3D pen was not affected at this temperature. I formed the familiar simple fold. The pink filament formed clumps. I worked to spread out the clumps. A resemblance to sample p1-75 suggested itself. The backlit view has a spiderly effect. Writing the above has been a good test of my current note-taking system. The ricepaper inktense drawing above has now dried and looks perhaps slightly improved, although still extremely boring. My intention before the long pause was to combine it with the “3D sketch” produced above. 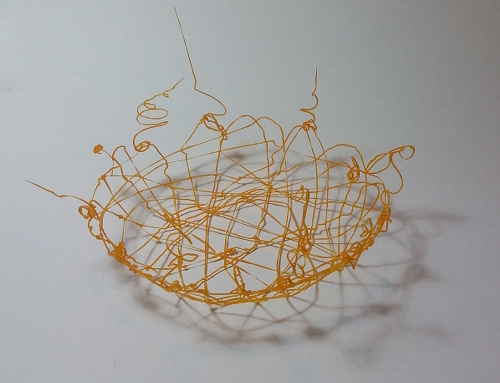 The drawing was torn and soaked in a bowl of diluted pva. 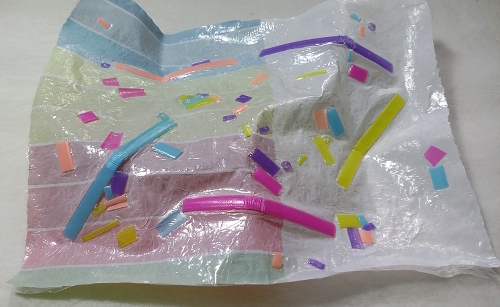 The pieces layered onto to plastic sketch. The result was a soggy mess. I tried to turn it over, thinking to encase the plastic in paper – but of course the paper just fell off. No photos – I was too busy dealing with the mess. A couple of days later it was dry. It took some effort finding shadows to give any definition in the photo above. 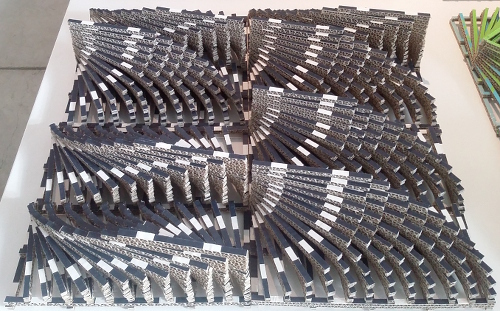 Patterning on the paper interacts with the shaping of the work in a deadening way. The view from the other side has the advantage of the plastic which provides a tiny bit of form, a path for the eye – but it’s marginal. The backlit views make the work more readable, but at the price of losing all the 3D aspects which first interested me. There was no adhesion between paper and plastic. 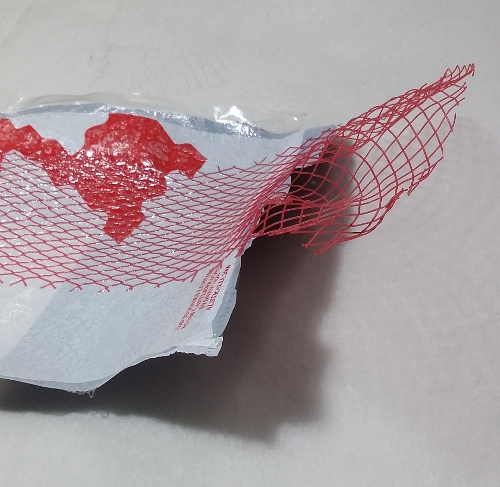 The plastic is quite brittle, and in a couple of places the paper had caught around it. I was able to separate them with just a few breakages. 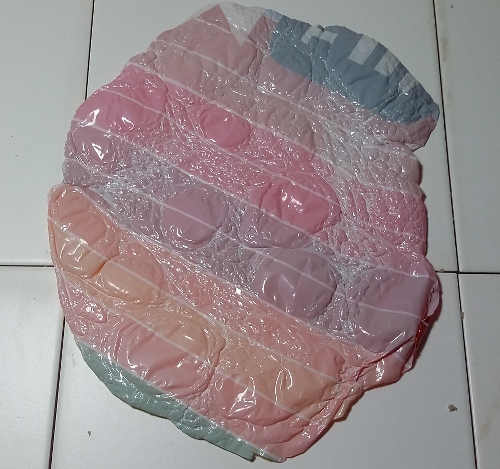 I wonder if a series would work – make a single plastic item, mould over and break off repeatedly, with the cast paper forms capturing the gradual disintegration of the plastic. The paper cast is fairly firm. I think if cut in stripes they would hold shape, but the whole thing wouldn’t resist a rolling pin for long. Perhaps because the pva was well diluted, the paper retains a papery feel. In further experiments it might be interesting to write on it or colour it – perhaps some shading to emphasise the heights and valleys. I prefer the backlit view of the paper on its own, compared to Photo 16 above where the plastic was still in place. Photo 19 is a detail, but it’s cleaner and crisper. It could be interesting to follow a similar process but use writing on the original rice paper. Perhaps some text about a place or an event in a location, broken and layered over a relief “map” of that location. A hill that was the focus in a military campaign is the first rather obvious thought. Print photos on the paper? (don’t know how the printer would like this particular paper, or the paper behave with the printing ink). I just poked a pin through the paper form. One could stitch through it, although care would be needed in handling to avoid breaking down the form. Or maybe a collapsing shape could be part of the point. Taking a step back from these ideas, I note that while I enjoy exploring the qualities of materials I often come back to wanting the results to mean something. A recent article on www.textileartist.org/ presents the work of Collette Paterson – www.textileartist.org/collette-paterson-oca-textiles-tutor/. Paterson is an OCA tutor, amongst many other work roles and ventures. Her work is strongly materials-led, within varying constraints of commercial briefs or desired outcome or product. She will sometimes follow the properties of material exploration, or select materials that have properties desired. All sorts of skills and techniques are used to create an innovative design. A commercial product. Do I have an artificial and probably snobbish and unhelpful divide in my mind? My initial reaction to Paterson’s work is “this is great, but not the path I want to take”. Why should I limit my paths (note the plural)?